No polygraph was necessary, unlike some adult fishing derbies to prove no cheating happened, for the 15 and under crowd at the 13th Annual Lakeside Optimist Fishing Derby & Family Fun Day at Lindo Lake Park on June 4. Big time money, like in some fishing contests, was substituted for what kids love better. 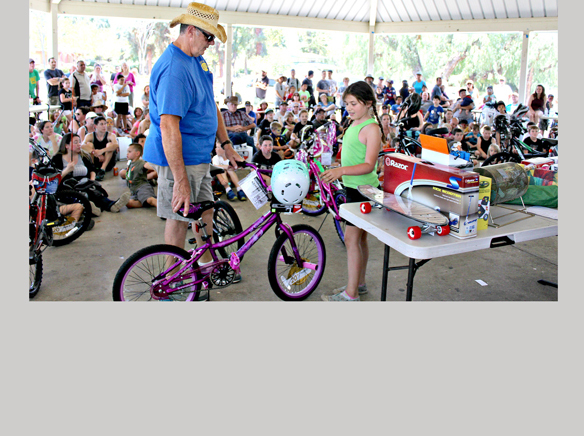 Bikes, new fishing poles, scooters, games, tickets to the Bulls Only Rodeo on July 15 & 16, plus more fun inspiring raffle prizes and awards. The event started at 7:00 a.m. and ran until 1:00 p.m.
Board said the event “costs thousands to produce but is a free event for the children.” Board also oversaw the coordination of prizes and awards that included 80 Padre, All Star totes courtesy of Rob Arnold with the San Diego Padres. Other sponsors included Barona Band of Mission Indians, El Cajon Ford, and Lakeside Bait & Tackle. Lakeside Optimist volunteers went by new names such as “the worm lady.” And those worms were supposed to be baited by the participants or brave parents or grandparents. Free face painting, a free lunch, autographs from Miss Bulls Only Rodeo 2016 Brittany Miller, and a visit with their respective vehicles from the firefighters with Lakeside Fire Department and County of San Diego Sheriff’s Department. Booths for Fight the Bite were staffed to educate the attendees about the West Nile virus. Lake Jennings booth promoted fishing at their newly stocked lake. The goody bags included hook removers, a fishing stringer, snacks, and hand wipes. Also teaching good fishing practices a Junior Fishing License was issued for the day. Night crawlers and chopped mackerel were free to the kids and each child or parent came up with their own techniques to land a catfish. Barbie poles and superhero poles popped up here and there with a baby carriage just as likely to caddy the poles to Lindo Lake’s shores as cast wearing boys and pink t-shirted girls holding fishing poles. Sisters Summer and Autumn Castle, both in the under 10 segment, not only placed but were part of the phenomena of “Fishing as a family for years” according to their father Brian Castle of Lakeside. The families that fished together, like the Castle family, were a common occurrence among the attendees that D.J. Board numbered at 1,000. The way Board set up the derby gave all the children a chance to be winners by providing raffle prizes that each child could land without having to land a big catfish. Lindo Lake had been stocked with catfish the day before. The award ceremony and raffle provided cross-legged kids the opportunity to moan when their raffle ticket was off by one number or to jump up to the prize table housed in the parks’ pavilion. The prizes were often bigger than the winner.